Edouard Manet was a highly influential figure in the French art world and as a result he had his innovative style and approach to painting and classical motifs, left quite the impression on the Impressionists (no pun intended). During the latter half of the 1860s, the Impressionists and Manet had been meeting at the Cafe Guerbois and Manet's nearby studio. Manet was therefore instrumental during the formative years of Impressionism and acted as the groups spiritual leader at their bi-weekly meetings at the cafe Guerbois. The traditional path for an artist, being academism, would mean that artists would coat the ground of their canvas with a dark layer of paint, such as brown. From this an artist would tediously build up layers on paint on top of the ground. However, this was time consuming and often resulted in a dulling of colours. Upon the successful application of a number of layers of paint artists would then glaze the surface to give the painting a smooth and highly polished finish. Manet, however, sought to paint and derive inspiration from real life, as he was of the Realist orthodoxy to painting. 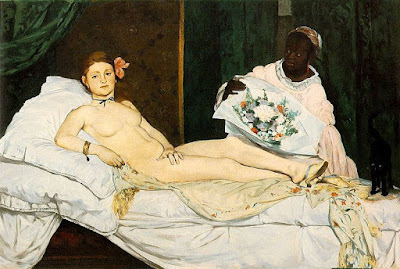 Manet was developing his technique so that he was able to complete the majority of his paintings in old sitting with the model. Rather than have to constantly revisit the same topic and influence the paintings composition, as if undertaken over a number of sittings the painting would no longer be considered to be real and spontaneous. Manet was able to have a rapid output with regard to his painting by no longer painting in layers and not conducting a glazing of his final product. Manet, can therefore be considered to be taking a major risk in his art. As Manet would have had to choose the correct colours from the start, in order to complete his painting as Manet would not have been able to really on several layers of colours which would have soften and lessened the extent of any errors. Furthermore is Manet painted with several layers he would have been able to rework any resulting errors on the canvas. As a consequence Manet would have to scrape off and remove any errors down to the bare canvas and repaint that element of the schema. Manet's treatment of his subject matter was undertaken using the 'all prima' technique, meaning that an artist painted 'at once' what they saw in the moment. As a means and a method for capturing modern, contemporary French life. Rather than depend on extensive reworking in the artist's studio of a painting. As a result the Impressionists began to utilise and adopt Manet's 'at once' approach towards their painting. Furthermore, Manet's artworks caught the attention of the Impressionists because his paintings aroused public and critical antagonism due to the paintings subject matter and also due to their slapdash technique, which was so admired by the Impressionists. Manet's other novel approach to painting involved painting in patches of colour. Furthermore Manet removed the need for blending between different shades of colour and modeling, which resulted in sharper contrasts between different features within the painting. However, without the use of subtle lighting and shadows to model and enhance his figures three-dimensionality; Manet's paintings as a result were spatially flat and lacked complexity. For example rather than subtly and progressively modeling the colours, features and contours of an object or subject Manet would rather simply and brutally apply a slash of a single colour which in turn dominates an area of the composition. Manet's approach to splash on a single uniform colour is known as 'Tachism' which is derived from the French 'Tache' meaning to blot. Manet's 'Tachism' technique was also employed by the Impressionist movement, however, instead of splash large surfaces of their canvas with a single colour, the Impressionists broke-down these colour patches into smaller and more harmonised groupings of colour; patches and confined splashes of paint. The reason why Manet's approach to art and treatment of his subject matter being so innovative was because his art bridged the gap between Realism and Impressionism. Manet's style of painting exhibited: innovations with both colour and brushwork.